Wire73686 Ultra 40 Spark Plug Wires Chevy SBC 350 383 400 Under Header HEI. Red, 90° Boots, HEI. Ultra 40 un-sleeved wires are a cost effective version of the Ultra 40 Race Wire without heat sleeving. 8-ignition wires as a set (complete set). CHEVROLET TAHOE 2000 01 02 03 04 05 2006 V8 4.8L. CHEVROLET TAHOE 2009 V8 4.8L. CHEVROLET TAHOE 2000 01 02 03 04 05 2006 V8 5.3L. CHEVROLET TAHOE 2009 10 2011 V8 5.3L. Part# MSD 84039. Blaster 2 Coil. Super conductor. 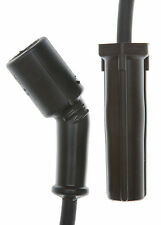 A Power Tower is also supplied to adapt a socket style cap. These are genuine MSD products, backed by their manufacturers warranty. These wires are custom fit for small block Chevy engines, designed to go over the valve covers. 90 degree boots assembled on both ends. Also includes a 35" coil wire. Small Block Chevy, 900 Boots, HEI, Over V/C. 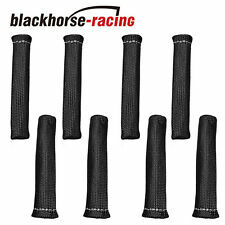 Product Description 100% Brand new, never been used Color: Black Length: 6" (15.5cm) ID: 1" (22mm) Set of 8 heat shield Rated for 1800°F continuous use, 2500°F intermittent Fits most spark plug boots even 90° Reflects and dissipates heat Double wall construction Always wear safety glasses, dust mask, gloves and long sleeves are recommended when handling this product High Quality Parts​ Professional installation is highly recommend No Instruction Included Package Includes. PRO STYLE HIGH PERFORMANCE IGNITION WIRE SEPARATORS - BLACK. These Ignition Wire Separators are to keep your wires in order, away from each other and away from the exhaust manifold, minimizing a possible miss-fire or a cross-fire. Heat Shroud is made from a high temperature rated glass fiber fabric with an aluminized outer facing. Same as Heat Sheath but with the added convenience of hook & loop closure design along the open edges. Without the need of removing one end of connected wires, cables, and hoses, simply wrap Heat Shroud around whatever needs protection and close edges..
1968-1962 Chevrolet Chevy II. 1960-1955 Chevrolet Truck. 1972-1962 Chevrolet Townsman. 1962-1966 Chevrolet Suburban. 1972-1968 Chevrolet P30 Van. 1962-1961 Chevrolet P30 Series. 1972-1968 Chevrolet P20 Van. Manufacturer: JDMSPEED. (600 DEGREES) 10.5MM Spark Plug wires for the. Chevy LS Engines. This is one of the best engineered wire sets available for the LS series engines. GMC Sierra 2013-2007. GMC Yukon 2013-2000. FITS 7mm 8mm 8.5mm 8.8mm SPARK PLUG WIRES. Moroso Ultra 40 Unsleeved Plug Wire Set. 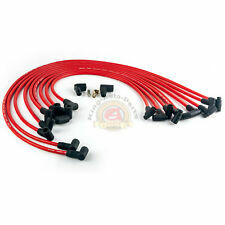 Moroso Ultra 40 Spark Plug Wires for Small Block Chevy. 73664 SBC HEI Blue Over Valve Covers No. 73666 SBC HEI Blue Under Header No. 73684 SBC HEI Red Over Valve Covers No. They were on a SB Chevy. They are the HEI style. These have the protective heat shield. They were only used 1 race weekend. Look at the pictures and you decide. READ THIS BEFORE YOU BUY. We do not cancel orders. Helically wound conductor suppresses EMI. lack 8mm silicone and synthetic jacket for high resistance to heat and abrasion. WHITE 8x 1200° SPARK PLUG WIRE BOOTS HEAT SHIELD PROTECTOR SLEEVE SBC BBC USA. green 1200° Spark Plug Wire Boots Heat Shield Protector Sleeve SBC BBC 350 456. New GRAY 8PCS 1200° SPARK PLUG WIRE BOOTS HEAT SHIELD PROTECTOR SLEEVE SBC BBC. ACDelco Professional 9748HH OEM 88862122. Replace Faulty Spark Plug Wire Set. Spark Plug Wire Sets. Spark Plug & Ignition Coil Set. Cadillac Escalade 2002-2005 5.3L 5328CC 325Cu. V8 GAS OHV Naturally Aspirated For Coils Stamped 12558693;. Heat Shroud is made from a high temperature rated glass fiber fabric with an aluminized outer facing. Same as Heat Sheath but with the added convenience of hook & loop closure design along the open edges. Without the need of removing one end of connected wires, cables and hoses, simply wrap Heat Shroud around whatever needs protection and close edges.. FITS HEI STYLE CAP OR POINT STYLE. 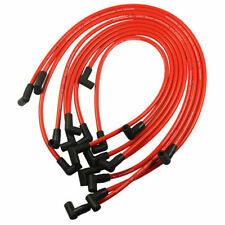 These wires will work with most any V-6, V-8 or I-6 engine that uses the 90 degree boots on the spark plugs. Check for exhaust or header clearance if you are not sure. Crimping Tool Material: Steel. Crimping Tool Finish: Black oxide. Crimping Tool Handle Material: Rubber. Crimping Tool Handle Color: Blue. Anything you want to protect or shield from radiant heat. Aluminized Heat Sheaths have a heat reflective mylar layer on the outside of the sheath and a high temperature woven fiberglass internal layer. 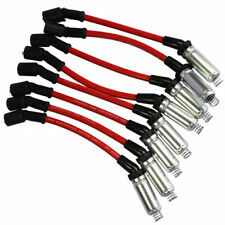 FITS 7MM 8MM 8.5MM 9MM 9.5MM SPARK PLUG WIRES. SATIN BILLET ALUMINUM WIRE SEPARATOR KIT. Moroso Race wire sets that out perform the competition at a price that the budget minded racer can afford! New Moroso "Mag-Tune" wire sets are a premium, top of the line ignition wire. These wires are a universal fit, you will need to assemble the distributor end. The silcone jacket with fiberglass braid is rated at 450 degree F. The distributor boot and spark plug are made of black silicone. 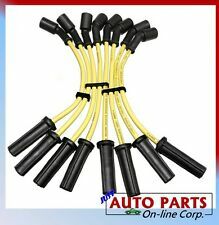 MOPAR 273 318 340 360. new 8mm 4000 Series Yellow Graphite Spark Plug Wire Set for universal applications. Ignition system. Interchange Part NumberSpark Plug Wire Set,D029-AS. 10.2mm spiral wound design. Superseded Part NumberSpark Plug Wires. 1992-2000 Honda Civic All Models. Other Part NumberGM Plug Wire. Heat Protection Aluminized Sleeving 1 in. WIRE/HOSE PROTECTIVE SLEEVING. Heat Sheath is constructed from a Hi-Temp fiberglass fabric bonded to an aluminized material with sides sewn together forming a sleeve. Compatibility table is to be used as a guide only. We provided a guide for you below. Failure to do any and all of the above voids the warranty. Any Product which has been altered in any way, improperly installed, or not used for its' intended purpose. Replaces the Following Spark Plugs. AcDelco 9748GG AcDelco 748UU. AcDelco 88862385 AcDelco 748GG. Spark Plug Wire Sets. Replaces the Following Spark Plug Wire Sets. Spark Plug & Ignition Coil Set. 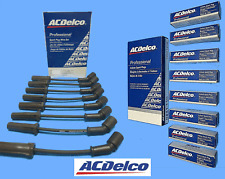 OEM 19299585 ACDelco Professional 41-962. (Spark Plug Sleeve. Made of Titanium that can hold 2500 degree F. Universal fit most straight or angled boots. Double layer construction for added durability. Fits most hot rods and classics engines including For GM,Chevy,GMC,OLDS,CADILLAC,PONTIAC,Buick,Ford And Mopar,Chrysler,Dodge,Plymouth). Gen III LS1 Vortec Trailbazer. Gen III LS1 Vortec. Gen III LS1 Vortec, Envoy. If you need 12", this item is the correct one. 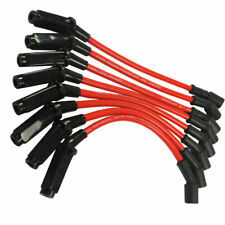 One Set High Performance Spark Plug Wire. C,K 1500 Silverado. C,K 1500-2500 Silverado, Ssr. · Reflects over 90 % of Radiant Heat. For best results seal the sleeves at each end with adhesive foil tape, shrink tube or stainless steel cable ties. To ensure a proper fit, allow extra room for bends (for example: a 90º bend in a 3/4" tube will NOT fit in 3/4" I.D. Sleeve, In this case you would need 1" I.D. or higher). Ready for Install Straight out of the box. Very often there is more than one part available per application as auto makers often switch midyear. It may take up to 24 hours for the system to update. Where is my item?. 1996-1998 Ford Crown Victoria 4.6L 281Cu. V8 CNG SOHC. V8 GAS SOHC. 1997-1999 Ford E-150 Econoline 4.6L 281Cu. 1997-1999 Ford E-150 Econoline Club Wagon 4.6L 281Cu. 1997-1999 Ford Expedition 4.6L 281Cu. AcDelco 9748UU Herko Automotive WGM48. New in Herko Automotive Box. V8 GAS OHV Naturally Aspirated. V8 FLEX OHV Naturally Aspirated. Replace Faulty Spark Plug Wire Set. Spark Plug Wire Sets. Spark Plug & Ignition Coil Set. Manufacturer: JDMSPEED. 2009 GMC Canyon 5.3L 5328CC 325Cu. V8 GAS OHV. 2010 GMC Canyon 5.3L 325Cu. 2013 Chevrolet Camaro 6.2L 6162CC 376Cu. 2009-2014 GMC Yukon XL 1500 6.2L 376Cu. V8 FLEX OHV. 2010 GMC Savana 3500 4.8L 294Cu. FITS 7MM, 8MM, AND 8.5MM SPARK PLUG WIRES. FOR V-8 ENGINES CHEVY FORD MOPAR. PLUG WIRE HOLDERS AND HARDWARE. NGK Japan Wire Set TE66. (Requires Only 3 Coil/Spark plug wires). Genuine Toyota Oil Filter 90915-YZZD1/3. This kit includes. Manufacturer: JDMSPEED. Ford Mustang 1964-1995. Ford F-150 1979-1995. Ready for Install Straight out of the box. Make sure it is the right prat for your car before you order it. Ultra High Strength/High Temp. VW Spark Plug Wire Set. Bug Bus Ghia. Ignition Wires. 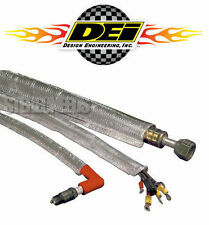 Ignition wires feature a silicone jacket and silicone plug boots for high heat and oil resistance. These ignition wires promote reliability with a snug fit on the spark plugs and distributor cap to significantly reduce the chance of a wire from coming loose. Feature: 100% New Construction 10.5mm Spiral Wound Design UltraLow Resistance KEVLAR Core RFI Suppression Ultra High Strength/High Temp. Silicone Boots and Sleeve Ready for Install Straight out of the box FIT FOR:. RED WIRE SEPARATORS. FITS 8MM, 9MM, AND 9.5MM SPARK PLUG WIRES. ANODIZED RED BILLET ALUMINUM. GREAT WAY TO CLEAN UP UNDER THE HOOD AND KEEP WIRES AWAY FROM HEAT. Ignition wires are essential for good engine performance and gas mileage. When drivers replace their spark plugs, they shouldn't forget to replace the wiring as well because it's responsible for providing electricity to the spark plugs. Without high-quality wires, drivers can face a number of car troubles. What are signs that your ignition wires have gone bad? What do damaged spark plug wires look like? Cracks and Abrasions: If the plug wires have been rubbing against the surrounding car parts, the resulting friction can cause cracks and abrasions. Burns: If they come into contact with the exhaust manifold, they often look singed or burned straight through. What types of spark plug wires are available? Magnetic Resistance Wires: These wires are commonly found in cars manufactured in Asia. 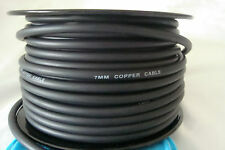 At the core of these wires is copper nickel alloy, which has a low resistance to electrical flow. This means that an engine igniting spark can be generated by less current. This copper nickel alloy is arranged in a coiled, winding pattern, which prevents any radio frequency interference. Distributed Resistance Wires: These options, which are sometimes referred to as carbon core wires, are made out of a fiberglass-impregnated carbon. While they are more commonly used on older cars, they are used for their high resistance to radio frequency interference. If a car was manufactured with this type of wire, it's best for drivers to select distributed resistance wires as a replacement. Fixed Resistor Wires: Fixed resistor wires are commonly found in European cars. 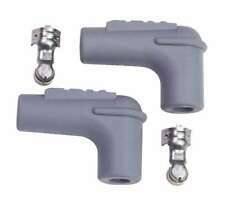 They are made using one of two metals, steel or copper, and the plug boot contains a resistor. This successfully prevents any radio interference. How do you choose spark plug wires for your vehicle? To choose spark plug wires appropriate for a specific vehicle, take a look at the ones already installed. Try to find ones as similar as possible in terms of type and length. Drivers should also take a look at the boot; some boots attach using clips while others use thread-on configurations. If drivers don't choose the right spark plug wire to connect to their spark plugs, it can have a big impact on engine performance.